Opportunity: International travel is a bucket-list item for most young people, and ACU is encouraging students to combine an overseas adventure with their education. STUDENTS get more than just a fun time overseas with employers and recruiters including these international experiences more and more on their checklists, associating them with personal growth, open-mindedness, intercultural skills, and independence. ACU Provost Professor Pauline Nugent said the ACU Rome Centre with The Catholic University of America is well placed to offer students a rich international experience, including local community engagement activities linked to our Catholic ethos. 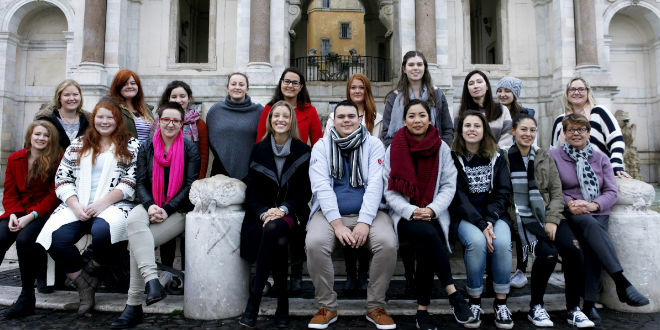 The newly opened ACU Rome Centre hosted its first group of students in January and second year Nursing student Eleanor Kirby was lucky enough to take part in the two week program. “It was one of the best experiences of my life, and I couldn’t believe how awesome it really was,” Eleanor said. “I learned so much about myself and other people, and saw how lucky I really am in my life. You will have a ball and if you can, travel before or after you go, it costs so much to get over there, you may as well keep travelling. “The timing was awesome, because I got to travel through five other countries and still be home with plenty of time before semester started. I had so much fun and loved every single place that I went to. I would definitely go again. “Being able to share ideas and views with like-minded students and tutors helped me develop a deeper understanding of those subjects,” he said. Executive Dean of Health Sciences Professor Michelle Campbell said the intensive unit approach was great as it allowed plenty of free time for students to enjoy Rome, and its surrounds, during the evenings and weekends. “Offshore intensive units are a powerful mode of learning for ACU students and this residential unit at our new Rome Centre offered students flexibility in their learning with ACU,” she said. Students were able to engage with the fascinating history and cultures of both ancient and Christian Rome. They had the opportunity to attend the weekly Papal address at the Vatican, as well as to visit the Vatican museums, the Sistine Chapel, St Peters Basilica, the Colosseum and the Pantheon. Recent visitors to the campus have included the Australian ambassador to the Vatican, John McCarthy QC, who spoke about the problem of human trafficking and slavery. Jesuit Father Frank Brennan also met with students as author of a chapter in the unit text book, Fr Brennan’s attendance at lunch was most appreciated. Students were also given a talk by the Monsignor Jean-Marie Mate Musivi Mpendawatu from the Holty See’s Department of Health and Welfare. He praised ACU as a “university of the future” for its avoidance of offering degrees in medicine and focusing, instead, on alternative approaches to promoting human health. Exposure to new cultures, languages, communities and experiences mean students return from overseas placements with an expanded understanding not only of the world around them, but of themselves. Rome is just one of the amazing places where ACU students can combine travel and study. Find more about International Study Experiences in many countries across Asia, Europe, North America, South America and more. Previous: What exactly is an annulment?